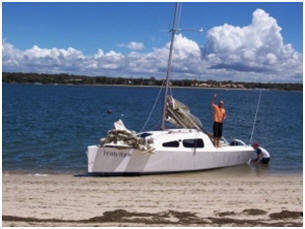 The 750 cruiser design “Hillbillies” was commission by a Jason and Michael Lucas of Bribie island QLD. She is 7.50 metres long and 2.45 metres beam and is trailerable. 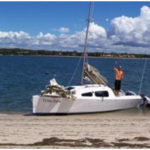 Keen surfers, they wanted a large volume boat which they could build themselves and load with surf boards for adventures around Moreton bay and the coast. The emphasis was on economical construction and large volume interior rather than ultimate performance. The hull form is single chined being sheet plywood above and strip planked below. The cabin top is strip planked and the cockpit is sheet plywood. The interior volume has been further improved by bringing the cabin top right out to the gunwale. The rig has been kept simple with double spreaders and no backstays. 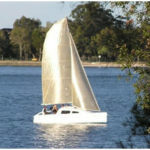 The aluminium centreboard is filled with lead and pivots up flush with the bottom of the boat allowing her to dry out. Twin kick up rudders have been utilised.